Low fuel consumption (low CO2) and environmental adaptability (low NOx and low noise) are strongly required world-wide for aero-engines. The most important issue for enhancing global competitiveness is the development of advanced technology to meet these demands and to establish Japanese superiority in the aviation industry in an early stage. Furthermore, state-of-the-art technology that eliminates fossil fuel usage while providing high-speed convenience and environmental compatibility is developed and demonstrated in an effort to explore new air transport infrastructure. An effective element in achieving low-NOx combustion is realizing stable combustion through an effective method of lean-premixed combustion. 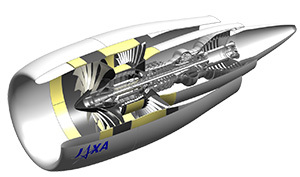 JAXA is taking a complementary, three-pronged approach that combines advanced combustion technologies, combustion stabilization technologies, and combustion measurement technologies to solve these problems and establish research results as basic technologies for next-generation jet engines. JAXA is currently working on technologies to suppress combustion instability, one of the pivotal technological challenges in the development of low-emission gas turbine combustors. For example, JAXA is currently developing technology to weaken the primary driving source of combustion instability by using fuel injection control to intentionally deform flame structures and blur the heat-release response against flow disturbances. JAXA will continue to contribute to the spread of next-generation alternative fuels by analyzing how the environment is impacted by alternative fuels such as bio-fuels, and by identifying issues in the practical application of such fuels. In order to facilitate the development of aircraft engine combustors, JAXA is working to realize design tools which predict the dispersion, evaporation, mixing, and combustion of liquid fuel particles inside realistically-shaped combustors. JAXA aims to realize advanced, high-refractory materials for hot section parts (high-pressure turbine parts, etc.) of aero-engines, multifunctional structures using shape memory alloys, and additive manufacturing materials. By utilizing cryogenic propellant testing facilities and testing technology, JAXA is working to establish a cryogenic fuel supply system that can also be applied for general use in society on a broad scale. JAXA is developing a combustion diagnosis technology that utilizes high-speed OH-PLIF measurements at a sampling rate of 10,000 Hz. High-speed OH-PLIF measurement captures time-series photographs of flame structures, clarifies the causes of combustion instabilities, and provides design guidelines for realizing stable combustion. JAXA will work to realize practical application of combustors which use low-NOx fuel nozzles that it has developed, and to verify the feasibility of combustors through annular combustion testing. This study will demonstrate the feasibility of a VTOL aircraft with a "ducted fan" configuration, which has the potential to be an affordable, reliable VTOL passenger aircraft format ideal for routes linking local cities.